Pelham Grenville Wodehouse (pronounced Woodhouse), is quite a name for a famous British humorist. That is why is P.G.’s name was more suitable when it transformed into the childhood nickname of “Plum", which not only made more sense but was better suited one of the funniest writers of his time. Born in Guildford, Surrey England on October 15, 1881, he died February 14, 1975 in Southampton, New York just four months past his 93rd birthday. In adulthood Plum was an inveterate jet setter, meandering between his native England and the United States. However, he was not in love with traveling. In fact, his parents always lived somewhere else, even while he was a toddler. His father, Henry Ernest Wodehouse, known as Ernest, was in the Civil Service and went to Hong Kong in 1867. Ernest became a magistrate, a husband and a father. He married Eleanor Deane, daughter of the Reverend Deane of Bath in 1877. Eleanor was a talented artist and self-taught painter who named her children oddly: Peveril, Armine, Pelham Grenville and Richard Lancelot, as she had no taste for the mundane. Pelham Grenville was the third son and practically raised himself from two years old. His parents wanted the boys to have a good education and proper English upbringing and were clearly prepared to sacrifice closeness by leaving the children in England to make it happen. This state of affairs meant that the parents and children would see each other only once every six or seven years when they returned on home leave from Hong Kong. The boys lived in a rented house in Bath, in the charge of Miss Roper, who was very severe and made the boys dress formally (and spotlessly) every day. Soon, the boys were sent to a Dame School at Croydon, run by two unmarried sisters. They were very strict but kind. The boys often made the rounds, staying with other members of the family: Grandmother Wodehouse’s home at Ham Hill, aunts and uncles in Guernsey in the Channel Islands; and finally, the very small public school, Elizabeth College; life was pleasant. It was not until he and Armine were together at Dulwich College that Plum knew he was home. Plum’s school life created his first world. He mined the school setting often for his short story collections, which earned him his first money from writing. When he was a young adult, Plum’s father tried to shoehorn him into a banking job at the Hong Kong and Shanghai Bank, but Plum disliked the work and admitted to not understanding finance even though he worked his way up from mailroom. In fact, he was a bit of a bumbler about directions, money and problem solving. He never liked to worry, carry money or tend to house pets. He left the bank in the second year to go to work for the London Globe. Plum Wodehouse wrote to the exclusion of life. He committed to so many books, articles and the like that one could say he lived on paper. He would plot things out until he had 400 pages of notes, some he could barely read or understand. Then came a moment when it got started, when the scenario survived testing and became a plot. He did have an ear for characterization and dialogue. He wanted to get into the novel’s dialogue as soon as possible and go for speed. Plum would write to the big scenes and squeeze every bit of juice out of them. In his mind, he made them characters as if in a play. Plum and his wife were living in France when the Germans invaded in 1940, World War II. They didn’t escape because they were fond of their two dogs and the English quarantine laws made it difficult. Plum was interned for a year in Germany and made some radio broadcasts describing his life in camp. He regretted making the CBS radio stories, as they put him in hot water with just about everybody. “It never occurred to me that there was anything wrong in the broadcasts," Plum said in an interview. “They altered my whole life. I suppose I would have gone back to England and so on if it hadn’t been for them." The supreme Reginald Jeeves: He is the ultimate competent butler situated with a wealthy and mostly idle Londoner name Bertie Wooster. He was created in 1915 and was to appear over a span of 59 years in one way or another. Clarence Treepwood, 9th Earl of Emsworth is an absent-minded tweed-jacket-wearing lovable character who is none-the-more happy than when his is talking to his prize pig or sometimes relaxing in the idyllic gardens of Blandings Castle. Rupert Psmith (the “P" is silent) is a member of the Drones Club and as an Old Etonian, a fluent and witty man. Mike Jackson is Psmith’s friend and sidekick—an original hero and central character of Mike and Psmith in the City. “He was in the acute stage of that malady which, for want of a better name, scientists call the heebie-jeebies." Spring Fever, Chapter 3. Jasen, David A. P.G. 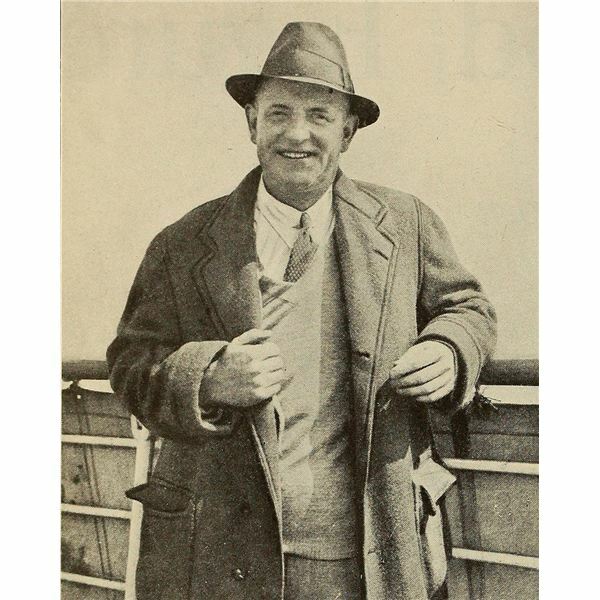 Wodehouse: A Portrait of a Master. New York: Mason & Lipscomb Publishers, 1974. Book.